�����This has been an interesting year for metals to say the least. With prices wreaking havoc on numismatic portfolios and investments, discretionary cash reserves have dwindled as well. Gold and Silver began the year at $1,225 and $19.94, respectively. There were some wild ups and downs during the year with many betting on the wrong direction which led to some substantial losses for investors. 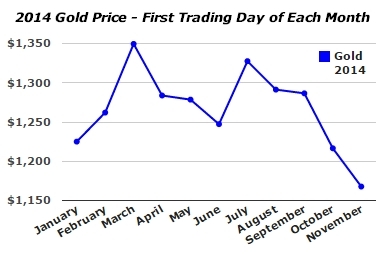 �����Below is a graph showing the significant changes in the price of Gold from the first trading day of each month. What this graph does not show are the daily dramatic swings that created much of the negative impact on interest in buying bullion related coins. �����Throughout the year there have been thousands of coins changing hands, some selling for record prices and others trading at discounts. 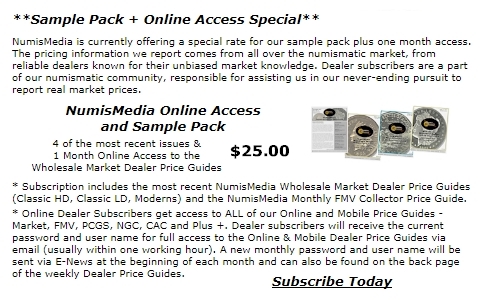 Using the NumisMedia 500 we can see which coins have had the greatest price increases and also which ones lost the most ground. �����One of the top gainers for 2014 was the 1875 $5 Gold in AU55; it began the year at $95,500 and nearly doubled to the current $182,500 Market price. This date had an original mintage of just 220 coins and the highest certified by either PCGS or NGC is an AU58. There are only 12 coins certified in all grades from XF40 to AU58. �����Another big winner was the 1864 S $10 Gold in XF40, which gained 102.7% for the year from $18,500 to the current Market of $37,500. This is also a low mintage issue with only 2,500 coins. No coins have been certified in Mint State and there are only 29 coins certified by PCGS and NGC in grades VG10 through AU55. There are a number of factors leading to these impressive price increases, predominantly many of these rare coins have not been on the market for some time so the previous price data was outdated. �����The coin with the greatest percentage increase for the year was the 1885 S $20 Gold in MS65, with an increase of 132.94%. There are only two coins certified in this grade, both by PCGS, and there are none higher. This date does not have a particularly low mintage with 683,500, but the majority of the coins that were saved from the melting pot were not as nice as some other dates. With only two highest grade coins available, Registry collectors have little from which to choose. Below is a chart of some of the highlights of the top gainers for the year. �����An interesting note about the coins that have increased so dramatically this past year is that many of them are circulated coins; they aren�t the best grades for the date but they are truly rare coins. In most cases, for these rare circulated coins, the populations drop quickly as the grades improve. If you could have purchased the above ten coins at the beginning of the year at the then listed Market price the total cost would have been $707,950 compared to today at $1,059,750; that would be a profit of $351,800. Of course, we suspect it would have been difficult to locate these coins, let alone purchase them at those prices. �����There were several thousand other coins that had price increases in 2014. Even the 500th coin listed in the NumisMedia 500 gained 21.02% for the year; it is the 1880 $2 � Gold in AU58. It increased from $785 Market to $950. �����Conversely, there were coins that did not have such a good year. Nobody likes to dwell on the negative but the facts are readily apparent. The following list illustrates a few of the notable declines for the year. �����Although we chose to exclude modern bullion related coins because of their generic nature, the majority of the declines are made up of modern issues as well as much of the common dated U.S. Gold. A reversal of form in 2015, with the metals showing better results, could make for a much different set of best and worst performers next year.